The River Chess Association has a team of trained volunteers who carry out monthly monitoring of the fly life on the Chess, as part of the national Riverfly Partnership Monitoring Initiative. Monitoring has been running since 2010 and was started to provide a regular assessment of the health of the river, which is under pressure from a variety of sources (read more about this on our Chess Under Threat pages). Riverflies are monitored because they are sensitive indicators of water quality and their populations will decline in response to pollution events. 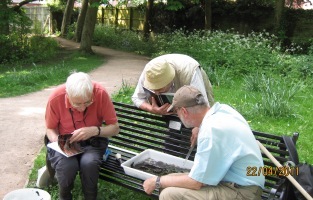 Thanks to funding by the Chilterns Chalk Streams Project, a number of our local volunteers attended a one-day workshop run by the Riverfly Partnership, to train them in assessing the health of the river through the detection of different groups of these invertebrates. Now each month, the qualified volunteer monitors carry out a three minute kick survey at 8 sites along the length of the Chess. 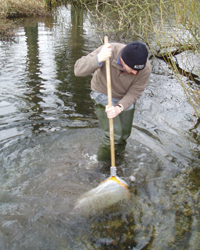 The kick survey disturbs invertebrates from the riverbed, allowing them to be collected in a net. The monitors also carry out a one minute search of rocks to collect any invertebrates that live on their surfaces. Once the search is completed, the monitors process the sample, identifying invertebrates from eight target groups (cased caddis fly, caseless caddis fly, mayfly, blue-winged olives, heptagenid nymphs, baetis, stoneflies and freshwater shrimp) with differing levels of sensitivity to pollution, estimating their abundance. This information is used to calculate a score for each site, which is then sent on to the Environment Agency for their records. If the score for a site falls below the trigger level set by the Agency, this will initiate a pollution investigation. The 8 sites have been carefully selected to detect potential pollution from a variety of sources, e.g. run-off from urban areas and sewage discharge. Not only will the monitoring detect pollution incidents, but it is building up a long-term picture of the fly life along the length of the Chess. It also provides an opportunity for volunteers to regularly get out on the river and the RCA is very grateful to all our volunteers who go out monitoring whatever the weather, and to those landowners who have generously allowed access to the river on their land.